I should have mentioned in the entry following our vacation that I went to a yarn shop at Pawley's Island while we were in South Carolina. It is called Island Knits and is located in the Island Shops, right along Route 17. Take a look at the photos of their shop on the web page. The setting is just beautiful. It is set among several other small shops, surrounding a creek with a pond. They have ducks and swans; my husband and sons even saw either heron or an egret while we were there -- right in front of them, hoping up on the railing before flying away. The shop itself is very nice. It has a front porch with rocking chairs. Sample knits on the porch and all through the shop. The lady who was working when I was there was very friendly and helpful. I had a great time shopping. She invited me back the next evening for there Wednesday evening class. 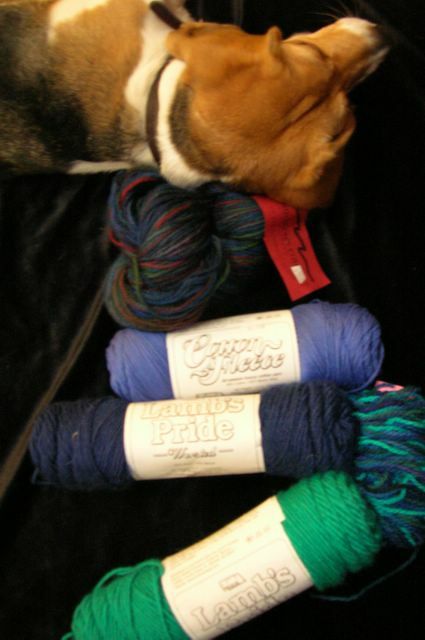 I bought the yarn and needles that you see above. One of them is Ritratto by Tahki Stacy Charles. 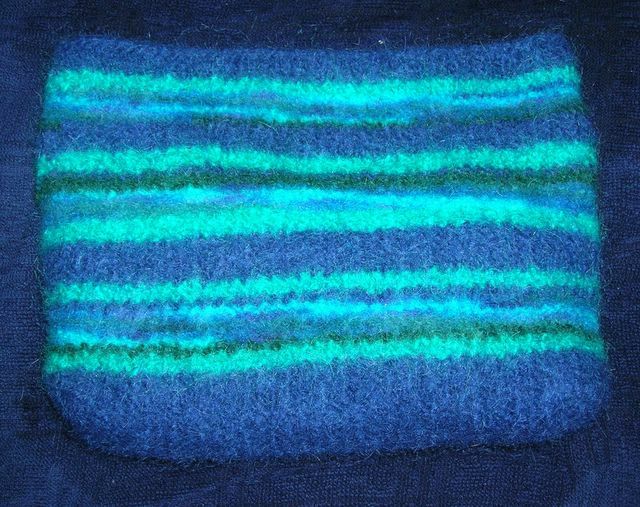 It is a mohair (28%), Viscose (53%), polyester (9%) and Polyamide (10%) blend. It is color #64. The other one is the Trendsetter yarn, Spruce in the Blue Calvin colorway. I bought these two yarns to make a "Spider Shaw" -- a free pattern that they gave me at the store. I also bought a pair of Brittany needles, size US 8. I just loved the ends of the needles; aren't they pretty? I would recommend this store! Thanks to JK and this post in the Knitter's Review forum, I was able to add buttons to my sidebar that are links. I am so happy! I now have lots of buttons. 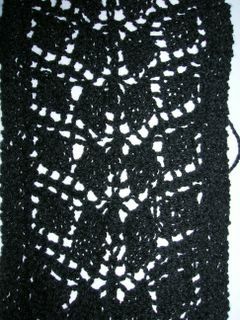 No new picture to post of the Branching Out scarf, but it is coming along. I've finished almost 16 repeats, which means that I am over half-way done. I've never knit with anything like this silky wool -- it feels different that other yarns I've used. I'm anxious to block this baby and see how she does. I've joined the Branching Out knit along (link on the sidebar). It is fun to see all the different versions people are doing. I don't know how to do it, but I think one done in fall colors would be nice, especially if it could be done like this one that Alison from Digital Yarn has done. Very subtle color changes. Wendy at Wendy Knits has started a Summer of Lace. There is a yahoo group going hosted by Wendy -- post on sidebar -- as a knit along. I never thought of myself as a lace knitter, but I guess Branching Out is lace, and so is my Koigu scarf. I learned alot of increasing and decreasing stitches with the clapotis, so maybe it is time to learn something about lace. I joined the KAL. We just got back from vacation, and I thought I would share what I knit while we were there. 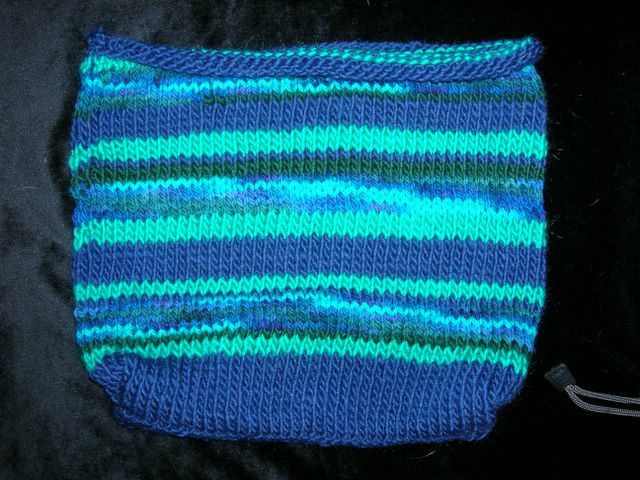 I started a clutch from the book Weekend Knitting by Melanie Falick. I knit it from these yarns (except the Mountain Colors) that I mentioned before -- the blue, teal, dark green and remainder of Shaeffer Yarn. I felted it this morning. I has turned out larger than I anticipated, so I'm turning it into a purse -- I just need to find out what handle to use. I also need to figure out how to sew in a zipper. I've never done that before. I started Branching Out from Knitty. 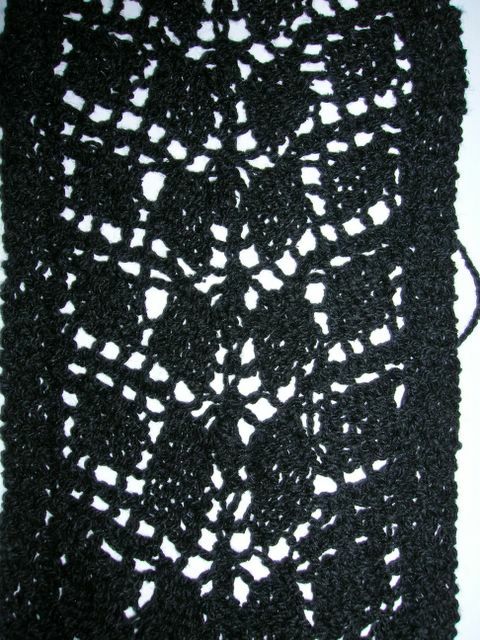 This is a lace scarf that I'm doing in Elizabeth Lavold's silky wool. I saw the pattern on Knitter's Review and realized that I already had the yarn for it. Amazing. I like it so far. I'm about 10 repeats into it. I'm trying to teach myself to use the chart -- so far, so good. 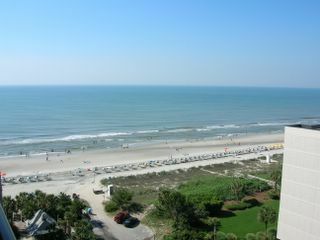 I've also included a view from our window on vacation. Nice to sit here on the terrace, admire the view and knit. Oh, and I read the Yarn Harlot's book book book, and loved it -- A Knit's End: Meditations for Women who Knit too Much by Stephanie Pearl-McPhee. We went on a surprise trip to Lexington, Kentucky last Saturday, which, of course, included a trip to the Stitch Niche. 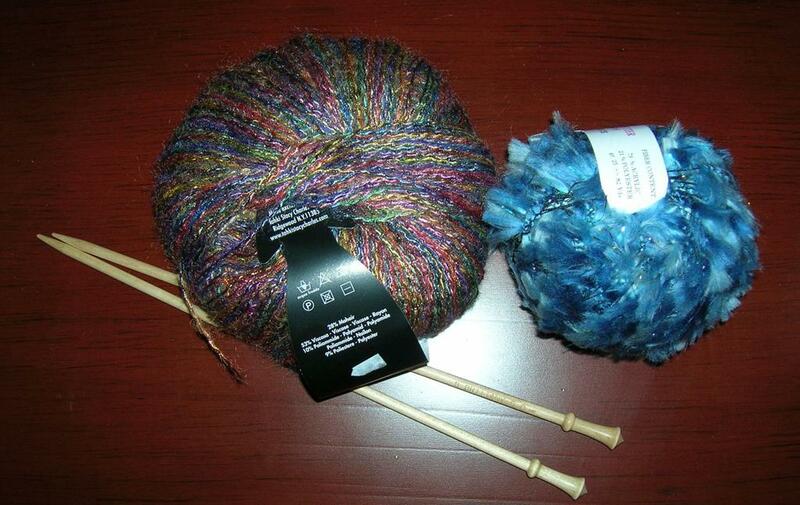 I have been wanting to try some Koigu yarn (made in Canada -- I didn't know that), so I bought two skiens of a blue colorway, number 818. 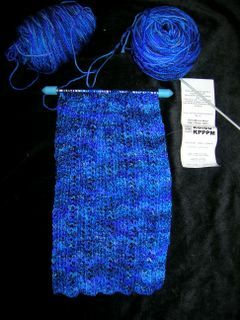 I really like it, and have started a scarf from a Koigu book called "a rib lace scarf." It's done on US size 3 needles. I bought a circular set from Susan Bates -- Quicksilver. I don't like them for this project. They are too dull, and the cord is too short -- 16 inches. So I switched to my sock needles from Knit-n-Hook in Huntington. They are Inox needles -- only six inches long, but I keep a point protector on one end, and they are doing great.